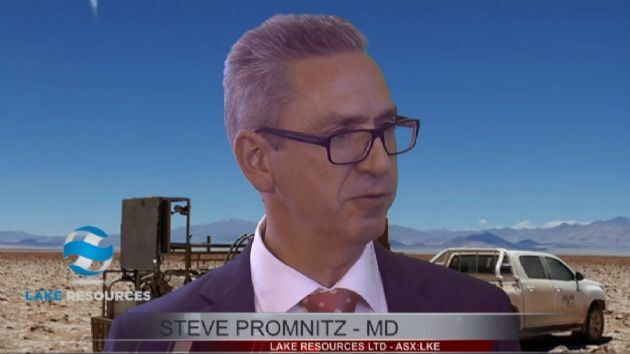 Brisbane, Aug 1, 2018 AEST (ABN Newswire) - Lake Resources NL ( ASX:LKE) is an exploration and development company with one of the largest lithium lease holdings in Argentina of 180,000 hectares, including areas under option with four prime lithium projects: 3 brine projects and 1 hard rock project. Each project is capable of being a 'company maker'. These include the Kachi Lithium Brine Project which covers ~54,000 ha of consolidated mining leases over a previously undrilled salt lake; the Olaroz/Cauchari and Paso Projects in Jujuy province adjacent to Orocobre and SQM/Lithium Americas; and the Catamarca Pegmatite Lithium Project (~72,000 ha), under option, with large pegmatite swarms over 150km of strike. 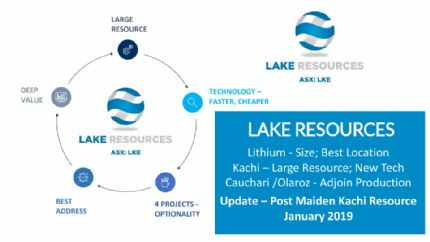 - Four prime lithium projects - 3 brine projects and 1 hard rock project in Argentina - with one of the largest lithium lease holdings in Argentina of 180,000 hectares, including areas under option. - Drilling ongoing to produce a maiden resource at Kachi in the coming months, anticipated in October. - Approval to drill the Olaroz-Cauchari leases is nearing completion, ready to drill in the coming weeks. - The Olaroz-Cauchari leases adjoin lithium brine production of Orocobre and development projects that have over 15 million tonnes LCE (Lithium Carbonate Equivalent) in Jujuy in the same basin as Orocobre and SQM/Lithium Americas. A landmark agreement was signed with Jujuy Province that confirmed tenure. 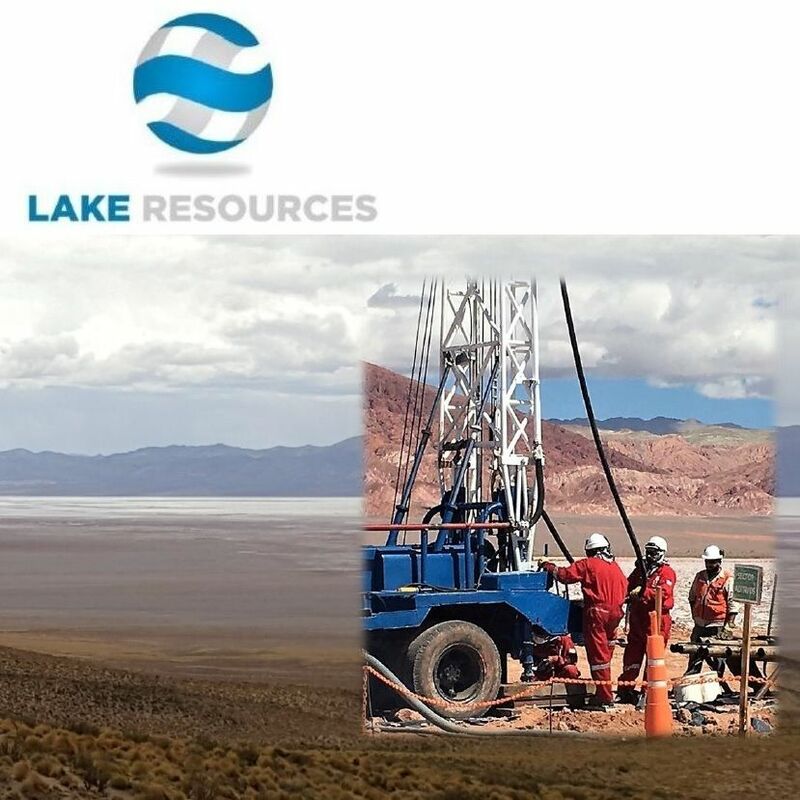 - Lake secured a A$1.9 million option underwriting agreement for the listed 10c options, LKEO, expiry 27 August 2018, which supports drilling activities. - Corporate activity continues in Argentina with US$280 million being paid for a 1.1 million tonne resource of Galaxy, located ~100km north of Kachi. A maiden resource estimate is anticipated in the coming months at the Kachi project. The large scale with a single owner appeals to battery makers and is well suited to a strategic investment/partnership. 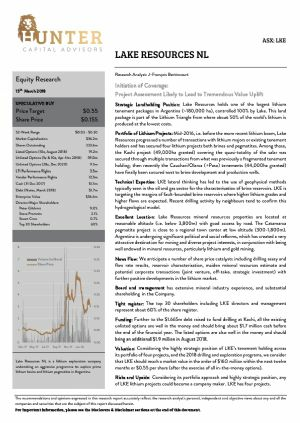 Drilling on the Cauchari and Olaroz leases will commence soon, which appear to be extensions of known lithium resources that have over 15 million tonnes LCE (Lithium Carbonate Equivalent).